Energy efficiency is important not only to curb runaway power consumption but also to accommodate more data center capacity. If a company can recover capacity, it can delay spending on capital improvements. This e-book will discuss power consumption trends in the data center, why energy efficiency matters, how to reduce your power footprint, and benchmark metrics that will help you measure your progress. Data center energy efficiency has become increasingly important to IT departments. With IT departments now on the hook for reducing their energy use, technologists look to sources of inefficiency and see that commodity scale-out servers are clear culprits. In chapter 2 of this e-book, we'll discuss server efficiency tactics, fixes and other strategies. 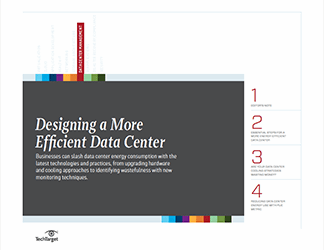 Get answers to your toughest data center energy efficiency questions in this e-book. Chillers, air handlers, power distribution, backup power - all of the mechanical processes that keep servers running smoothly account for more than half of an IT energy bill. But this is changing. Energy-efficiency best practices and equipment designs are available to help enterprises reduce their data center energy usage. This e-book covers data center cooling principles and raised-floor cooling, hot-aisle/cold aisle containment, high-density supplemental systems as well as the pros and cons of economizers. It also gives you the latest information on the long-standing direct-current (DC) power debate, and you'll get answers to your toughest data center infrastructure questions.